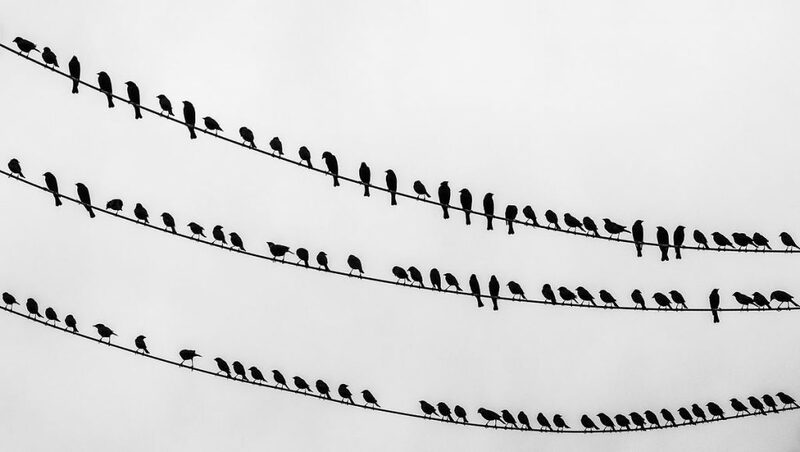 Are there birds on a wire near you? What are they doing? Are they all facing the same way? Birds face the wind when they’re perched so the air doesn’t ruffle their feathers and make them uncomfortable and cold. They also land and take off facing the wind so they actually arrived in that direction. if the birds are not facing the same way, the breeze is very light or the air is calm. Kate, I always see birds sitting on the same section of wires over an intersection. Is it because of heat from the waiting cars or exhaust , or just a good hunting or resting spot? Kat, I think it’s probably because it gives them a good vantage point — perhaps to see nearby food and predators. There are 50-70 pigeons in my neighborhood who pick certain wires to perch on. That location gives them a good view when a neighbor comes out and throws down birdseed for them.